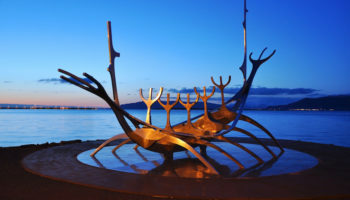 Reykjavik is the capital of Iceland and the hub for most international travelers. 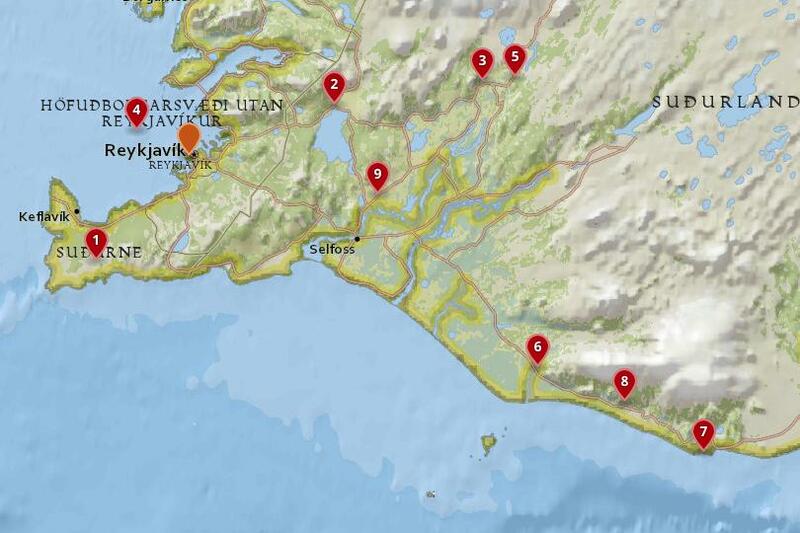 If you’re visiting Iceland, you’ll almost certainly fly into Reykjavik. 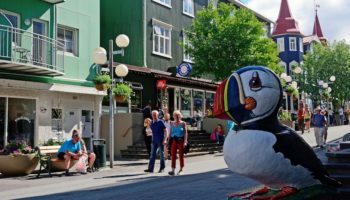 The city is full of incredible things to see and do, including its colorful buildings, the scenic pond called Tjörnin and the impressive art collection in the National Gallery of Iceland. 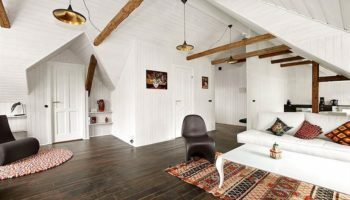 To truly experience what Iceland has in store, however, you’ll also want to supplement your time with some of the incredible day trips from Reykjavik to the following destinations. Less than an hour east of Reykjavik is Kerid Crater. This volcanic crater is filled with a bold, bright blue water, and it looks truly out of this world. You can walk around the entire rim of the crater in under 20 minutes, making this is a quick but unforgettable stop. If you’re feeling adventurous, you can also walk down from the rim right into the crater and get up to the edge of the lake. In the winter, you may spot locals walking on the frozen waters of the crater lake, but this is not recommended. Just an hour’s drive to the east of the capital, Kerid Crater is very simple to visit by car. Head out of Reykjavik on Route 1 and follow it until just before Selfoss, when you hop on the 35 heading north for the last ten minutes of the journey. If you have enough time after visiting the crater, you could return to the capital via the Golden Circle route, which takes you past many of Iceland’s most beautiful sights. A popular option with a lot of people who want to visit Kerid Crater is to take a guided day trip around the Golden Circle. This route takes you not only to Kerid Crater and Thingvellir National Park, but also to other breathtaking sights like the Gullfoss Waterfall and the Geysir geothermal area. See trip reviews & prices. Situated north of Vik, Skógafoss is one of the most famous, and most beautiful, of the waterfalls found in Iceland. Skógafoss is located in the village of Skóga, and it is a staggering 55 meters (180 feet) tall. If you’re up for a hike, you can set off along paths through the Skóga River Valley until you reach Skógafoss, and along the way you’ll see another dozen smaller waterfalls. There is also the option of taking a short trail to the top of the falls, which offers incredible perspective on the size of Skógafoss. At just over two hours from Reykjavik, Skogafoss is very simple to drive to. It is almost impossible to get lost, as you just need to follow Route 1 all the way there. Simply hop on the road heading southeast and follow it through all the beautiful landscapes you pass through. In this part of southern Iceland, there is a lot to see, so it is a good idea to plan your journey in advance and visit some of the other waterfalls, glaciers, and beaches in the surrounding area. 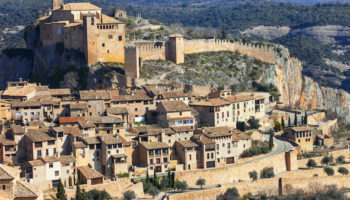 If you’re pressed for time, a great way to see as much of the southern part of the country as possible in one day is to take a sightseeing tour. 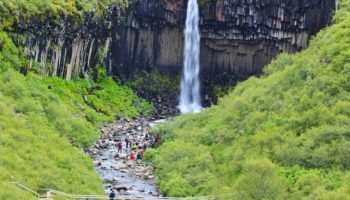 This is a very time-efficient way to visit the waterfalls of Skogafoss and Seljalandsfoss, see the beautiful black beaches at Vik, and the Solheimajokull and Myrdalsjokull glaciers. 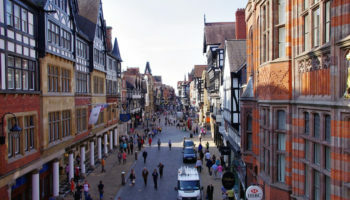 There really is a lot to see in the area, and your guide will tell you all about the wondrous natural sights as you go. See trip reviews & prices. Also known as the Black Beach, Reynisfjara boasts a shoreline covered in black pebbles and sand. It is also where you’ll find black basalt rock columns that stand out in a truly dramatic fashion. Many people come to Reynisfjara Beach just to take photos and admire the scenery, but it is worth noting that the area is also fantastic for watching birds like puffins and guillemots. A two-hour drive south along the coast will take you from the capital to the small town of Vik. Vik is well known for its enormous glacier known as Mýrdalsjökull, but an even bigger reason to visit is the chance to explore Reynisfjara Beach. On the way back, make sure to find time to stop off at the beautiful waterfalls of Seljalandsfoss and Skogafoss if you can. Another option if you don’t have a car is to take a sightseeing tour to the beach. 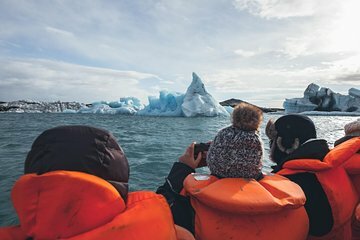 With a knowledgeable guide on hand, you’ll learn a lot about the country’s amazing landscapes and geology, while visiting Reynisfjara Beach and the glaciers of Solheimajokull and Myrdalsjokull – among other sights. See trip reviews & prices. Waterfalls are one of the major draws to Iceland and to the region surrounding Reykjavik, and Seljalandsfoss is one of the most popular of these waterfalls. Located near the town of Seljaland, the waterfall is more than 64 meters (210 feet) tall. It is possible to walk behind the waterfall so bring a raincoat as you will get wet from the drizzle. While you’re there, take the time to walk a little further away and spot Gljúfrabúi. This is a smaller waterfall, but you can get very close to the water and take some phenomenal photos. Lying just a stone’s throw away from Iceland’s southern coastline, Seljalandsfoss is around 130 kilometers from Reykjavik, and it takes about an hour and 45 minutes to drive there. From the capital, head southeast on the 1, which loops all around the island; merely stay on it until you see signs pointing you to the waterfall. While you’re in the area, it is well worth continuing on the 1 a little further to see Skogafoss – another delightful waterfall – and the beautiful black sand beaches at Vik. Many people wanting to visit Seljalandsfoss take a tour, which combines the best of southern Iceland’s sights in one unforgettable day trip. 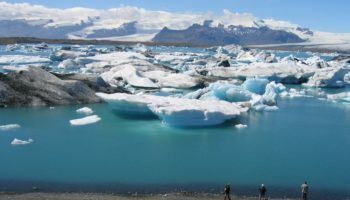 Alongside the two stunning waterfalls, visitors also get to explore the Solheimajokull and Myrdalsjokull glaciers. See trip reviews & prices. The name Gullfoss translates into English as Golden Falls, and it is one of the major attractions in South Iceland. While Gullfoss isn’t as tall as some of the other magnificent waterfalls in the area, it is a double waterfall, making it spectacular to behold. In addition, Gullfoss is fed in part by glacial runoff, which means that is is the highest volume waterfall in Europe. You can walk right up to a plateau that overlooks the waterfalls for amazing views over the water below. Lying to the northeast of the capital, Gullfoss is very easy to get to by car. Just head southeast out of the city on the 1 and turn onto the 35 heading northeast just before you get to Selfoss. After that, it’s just straight driving all the way. On the way back, you can take a different route to Reykjavik. This means you can stop off at the geysers of Haukadalur and the glorious waterfall of Bruarfoss. This route will take you along the 37 and 36 back to the capital. The journey time again is around an hour and 45 minutes. Taking a guided tour around the Golden Circle is an option that is popular with a lot of people, as it enables you to see many of Iceland’s most incredible natural sights in just one day. As well as visiting the glittering Gullfoss Waterfall, the tour also takes you around the beautiful Thingvellir National Park and to Strokkur – an impressive natural hot spring. See trip reviews & prices. Some of the most popular day trips from Reykjavik are whale watching tours. The bay outside of Reykjavik, known as Faxaflói, is home to a large number of whales throughout the year. On an afternoon or full-day trip out to sea, you’re almost guaranteed to spot a handful of minke whales. Humpback whales are less common, but you can still spot them when conditions are right. If you head to the harbor, you will see a number of tour providers offering the chance to head onto the bay and spot whales in the wild. From Reykjavik, lots of cruises depart daily to Faxafloi Bay, where you are most likely to catch a glimpse of the majestic creatures. See trip reviews & prices. Haukadalur is a valley in Iceland that it located about 90 minutes east of Reykjavik. This destination is best known around the world for being home to some of Iceland’s most spectacular geysers. 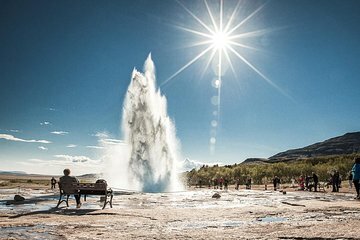 In fact, the name geyser itself likely comes from Haukadalur and its geyser named Geysir. Although Geysir doesn’t erupt frequently, when it does it is a truly magnificent display. Just next to Geysir is the geyser named Strokkur. This geyser erupts with amazing frequency, typically every five minutes. In addition to these two amazing geysers, the valley of Haukadalur is packed with geothermal hot springs and mud pots, creating an amazing landscape that you won’t soon forget. The journey to Haukadalur by car from Reykjavik should take you about an hour and a half. The simplest way to get there is to head southeast out of the capital on the 1 and follow it until just before Selfoss, when you turn onto the 35 heading northeast. This will take you directly to Haukadalur. After visiting the spectacular geysers, you should check out the nearby Gullfoss Waterfall. On the way back to Reykjavik, the beautiful Bruarfoss Waterfall is also well worth stopping off at. Many people who want to visit the area take a guided tour which combines the geysers of Haukadalur with a trip to Gullfoss Waterfall. In addition to enjoying the spectacular natural sights, your guide will take you to see Pingvellir – the oldest parliament in the world – and to Hveragerdi, a charming little village. See trip reviews & prices. Only 30 minutes by car from the Icelandic capital is Thingvellir National Park, which was a seat of government more than 1,000 years ago. Today, the national park is a sightseeing destination for its landscape as well its history. At Thingvellir National Park, you can set off on a hike through a fault valley, admiring rock formations among the green grass or winter snow. You can hike right up to Iceland’s first parliament site, although the spot is marked by a sign rather than extensive ruins. To see what the area would have been like in the past, the incredibly modern exhibits at the Visitor’s Center are a must-see part of the park. A great way to visit Thingvellir National Park is to take a guided tour. Over the course of the day, your knowledgeable guide will take you to see the glittering Gullfoss Waterfall, the spectacular Geysir, and the colorful Kerid Crater – among other sights. With so much included, your tour around the Golden Circle is a fantastic way to see as many of Iceland’s beautiful landscapes as possible in one day. See trip reviews & prices. In the south-westernmost part of Iceland is the Blue Lagoon. This destination is arguably the most famous spot in the entire country, and it is absolutely worth a visit if you’re in Iceland. This vast geothermal spa boasts warm waters filled with minerals, and the cold climate of the region means that the water is often covered in a thick layer of steam. In addition to soaking in the warm waters of the Blue Lagoon, you can find a waterfall to admire, or you can soak within a naturally formed cave. 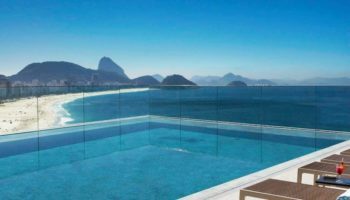 If you’re feeling particularly indulgent, there is also a spa where the natural minerals are used in treatments. 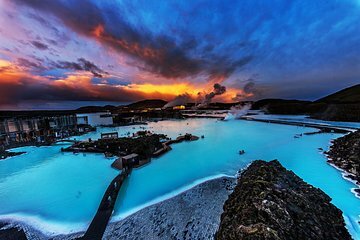 Lying around 50 kilometers to the southwest of Reykjavik, visitors wanting to go for a dip in the Blue Lagoon have a number of options available to them. While there isn’t public transport per se, there are regular bus transfers that run from Reykjavik; these depart on the hour from the capital. The bus journey takes about an hour, and there are 12 stops around the city at which you can hop on. As so many sights in Iceland are best reached by car, a lot of people opt to drive to the Blue Lagoon. Simply head south out of the city on the 40, then transfer onto the 41 heading west. After a while, you’ll see signs directing you to the Blue Lagoon. All in all, it should take about 50 minutes to get there. 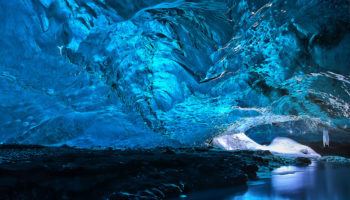 Many people decide to take a guided tour, as these not only include a visit to the Blue Lagoon, but also take you to Thingvellir National Park, the beautiful Gullfoss Waterfall, and the impressive Kerid Crater. While exploring the Golden Circle’s magnificent sights, you’ll learn all about the amazing volcanic landscapes you visit from your expert guide. See trip reviews & prices.